Please submit you name and email below to be placed on the cancellation/waiting list and to receive advance notice of the next workshop. Dan and Peter Sawatzky and their crew have long been known for their award winning dimensional signs that incorporate 3D sculptures into their design. They are now offering a three day workshop that will show just how they accomplish this MAGIC on a daily basis. Over the course of three long days Dan, Peter and their skilled crew will demonstrate and then guide you through the process from design, armature construction, shaping, sculpting in the detail and painting with their unique process. We'll carve concrete and Precision Board, weld steel, sculpt epoxy, paint and much more! Bring your work clothes for this is a hands-on workshop! Everything you need will be supplied - just come with an open mind and a willingness to learn. Lunch, dinner and snacks will be are included on Friday, Saturday and Sunday (snacks and lunch only). Enjoy an abundance of wholesome, home made cooking. They will show how the same design principles and sculpting techniques work on any size project, large or small. Each student will sculpt a project of their own, following step by step as Dan and Peter and crew demonstrate how even a very complex project is not at all difficult when broken down into small steps. They will show each student how to use the most basic tools to create texture and detail in such a way as to make the projects simpler and faster to finish. Dan will give a talk about how to market your new found skills as well. The workshop will be held in the Sawatzky's world famous studio/workshop, which is chock full of examples to learn from. We'll tour a current project in construction and see how everything fits togeher seamlessly. It will be three full days of high energy learning and inspiration - an unforgettable experience that will totally change the way you think about dimensional signs. on a first come - first serve basis. I enjoyed many parts of the workshop, but the most beneficial thing for me was asking the questions and getting the answers. I really enjoyed talking with Dan and learning about techniques, and workflows. I really felt like he understood the pitfalls we all face as creative individuals, having to do with business, and personality traits that come with being creative. In the past two years, I have been privileged enough to attend 2 of Dan Sawatzky’s workshops. The first year, I went in expecting to learn a few new things and take them back to my shop to use. What I didn’t expect was to have my eyes opened to such a degree that it turned my business on its head. The sign magic workshop was so much more than a workshop. Dan spent time teaching me to have fun in the sign business and to look at signs in a whole new light. Our business model and offerings have changed for the better because of it. 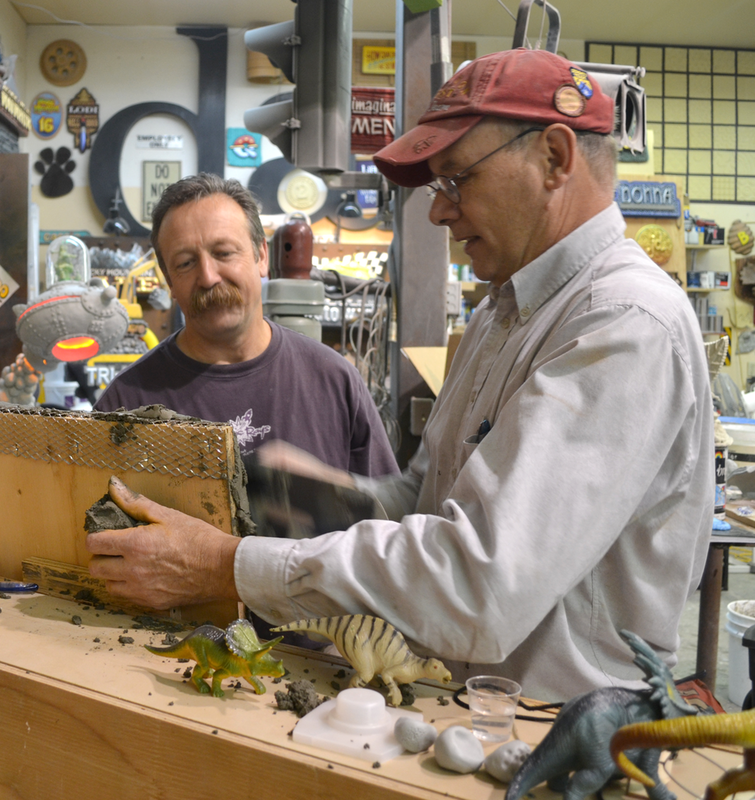 The second workshop I attended this past October was Sculpture magic. Upon returning back to Dan’s shop, I felt that fire that was lit all over again. Having spent very little time hand sculpting, Dan’s workshop brought out skills that I never thought I had. I returned home with an amazing piece of sculpture and a renewed spirit wanting do do as much with my new knowledge as possible. From the very second I turned into the driveway leading up to the Sawatzky’s Imagination Corporation shop I knew I was in for the ride of a lifetime! Every moment, every word, every lesson/story comes back to me again and again as I move along my creative path here at my shop. Dan and his oh so talented crew breathe new life and fun into how I approach my projects, everyday. These workshops are a generous invitation to experience the magic and impact of dimensional design and fabrication. Doors open to a world of new and fresh design possibilities. I signed up for the sign magic workshop at the very beginning of my own business. At the time, I thought I was going to learn about some new techniques and ideas I could apply as I went forward. It quickly became clear that the workshop was going to help shape the entire future for my new business. I didn’t just find inspiration, I found a match that ignited the fuse on an imagination firework that’s still exploding in a million colors today. Dan is one of those rare individuals that have “done it” become the best of what he does and even more rarely is willing and passionate about sharing his knowledge. I learned a great deal from Dan’s workshops in respect to marketing your company, building a strong portfolio in the work you “want to do” and as such have changed the way we do things to take on more exciting projects and create work that we are both proud to create and thoroughly enjoy doing.